Snow conditions are generally excellent. Unsettled weather continues with the heaviest snow falling in the southern Alps. Read our full report. Our full and detailed snow report below, that was filed on Thursday 31st January comes from Fraser Wilkin at www.weathertoski.co.uk. Snow conditions in the Alps are generally excellent right now. The freshest snow is in the northern French Alps, where areas such as the Portes du Soleil have seen as much as 40cm this week. The deepest snow remains in the Swiss and Austrian Alps, however, thanks to the massive storms earlier in the month. The other factor that has helped snow conditions in the last couple of weeks is the cold. It may not have always been frigidly cold, but for the most part it has been cold enough to keep the snow in good condition. Temperatures are expected to fluctuate over the next few days but it is expected to stay “coldish” well into February, which is great news in the run up to half term. Snow conditions remain excellent across most of Austria even if there hasn’t been a huge amount of new snow in recent days. In the north, Kaprun has 120/330cm of snow depending on altitude, while St Anton, in the west, has 95/505cm. It is only in the far south that some areas are below par. Bad Kleinkirchheim, for example, has a relatively modest 15/120cm though, even here, there is some fabulous piste skiing on offer. It is also here in the south where most of the snow will fall over the next couple of days. One area that has done particularly well this week is the Portes du Soleil, where low-lying Morzine (55/170cm) is skiing as well as anywhere right now. Higher up, it will come as no surprise that Val d’Isère (115/225cm) is also in great condition, both on and off-piste. The southern resort of Risoul (40/65cm) is also in good shape. The southern Alps are also set to see the heaviest of the snow that will fall over the next couple of days. Snow conditions are excellent right snow right across the Swiss Alps. The freshest snow is in the north-west, where Champéry has base depths of 80/150cm depending on altitude. After a shaky start to the season, the Pyrenees now have masses of snow, and a lot more in the forecast, especially in the north. 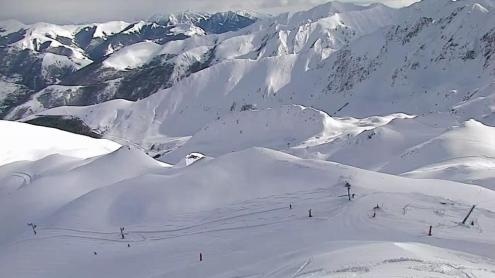 Spain’s Baqueira Beret now has 175/205cm of settled snow, while Andorra’s Grandvalira has 70/160cm. There is also plenty of good skiing to be had in Scandinavia, even if there has been relatively little new snow here in recent days. Norway’s Hemsedal has upper base depths of 85cm while Sweden’s Åre has 70cm. The situation in Scotland continues to improve, although snow depths are still modest and more snow is needed to get the season properly underway. Right now Glencoe has 20/25cm of settled snow depending on altitude. There hasn’t been any snow in Whistler since we last reported a week ago, but there is some forecast for this weekend, even if rain is more likely lower down, at least to start with. Snow depths remain impressive though, with 238cm packed down on the mid/upper mountain. There is still plenty of great skiing to be found in the western US. Although Colorado’s Vail (145cm upper base) may not have seen much fresh snow in recent days, there is plenty in the forecast early next week which will improve the already impressive snow conditions here. Utah resorts are also in very good shape, especially Snowbird/Alta which has an upper base of around 240cm. There is also lots of snow in the forecast here later this weekend and into next week.